Something wicked this way comes in Alice Lowe's stunningly psychotic feature debut, a comical and savage revenge arc so fresh in its female perspective. First-time features like Prevenge make any film festival worth all the travel, sleepless nights and horrendous dietary conditions. You know Lowe from her roles in Edgar Wright films – along with Sightseers and other cult phenomenons – but this year’s TIFF program proves the actress is equally as talented behind the camera than she is in front. 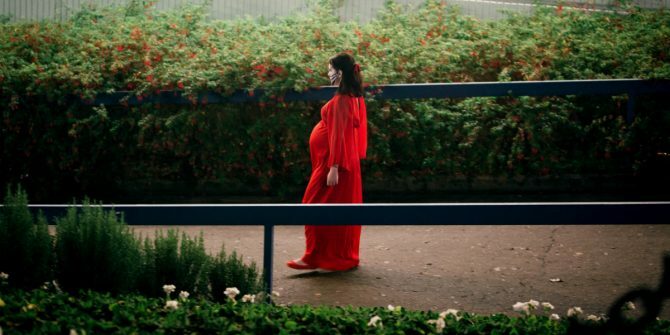 Prevenge is an absolutely mental debut that Lowe filmed while seven-and-a-half months pregnant, only making her mama-bear Voices inspiration all the more logistically impressive. This is unlike any revenge thriller you’ve ever seen, sporting the character fetishism of Tarantino and the slimy grossness of early Carpenter – but this is all Lowe, baby. Sweet, sinister Alice Lowe. If you couldn’t tell by the title, Lowe stars as a pregnant mommy-to-be (Ruth) who’s seeking revenge after the death of her husband. Ruth can’t do it alone, but she has an accomplice – the daughter incubating in her stomach. A little voice that encourages Ruth, and pushes her towards premeditated acts that involve killing everyone responsible for the death of her unborn child’s father. One by one, Ruth pays a visit to the climbing team who decided to cut her husband loose, until everyone has paid the ultimate price. If there’s anything worse than a woman scored, it’s a woman scored who’s being controlled by the dastardly baby inside her. Prevenge is punishing prenatal revenge mayhem that oozes breastmilk and blood, sometimes in the same scene. This is a new ballgame for slasher viciousness, pooling an entire genre’s worth of twisted, violence-happy payback with a squeaky little voice shouting c-words from her murderous mother’s tummy. Corruption begins for Ruth’s child before she’s even born, as her baby’s first journal is filled with information about each victim set to be executed. Then again, said evil baby could be the one doing all the corrupting, as long as the voice isn’t just lodged in Ruth’s head. Strangely enough, Prevenge ends up being a nasty little indie about grief, stashed somewhere with all the bloody comeuppances Ruth doles out. Revenge – first and foremost – works to remove a facade of innocence from Ruth’s pregnant form. Expecting mother or not, Ruth’s attacks lunge for the jugular while her unborn child masterminds the whole operation. This makes us believe we’re watching some wacky, pitch-back family allegory, but then true motivations are drawn out by Ruth’s interactions – both friendly and sadistic. Lowe is firing on so many different levels of consciousness, yet they all work together harmoniously with the most sinister, indulgently deranged intentions. Everything from emotionally painful suppression to sociopathic outbursts, along with a cartoonish insanity as an added cherry on top. Lowe herself is a true treat in all her character’s forms. As a cold-blooded killer, her remorseless puns and increasingly tested attacks are driven deeper by gushing practical gore in the way of sliced-up throats (and one nether-region swipe on unlucky DJ Dan). As a sideshow freak with a telepathic baby, so many dialogue exchanges pepper obscenities into spats between mother and daughter that are both hilarious and witty in a serial-killing Gilmore Girls kind of way. As both of those aspects packed in one mean mommy package, Lowe is a force to be reckoned with behind, in front of, or in the general vicinity of any powered-up camera. Ruth is the charismatic lovechild of Patrick Bateman and Uma Thurman’s “The Bride,” downright hypnotizing in her devotion to the articulate little monster turning her life into a living, freeing hell. Stylistically, Prevenge hits on all the right builds. Gore provides ample shock value with the gallons of blood drained during each kill sequence, while a synthy rock soundtrack brings us back to a grungier type of revenge film our parents might be more familiar with. When Kate Dickie’s lonely office drone finds herself bleeding out on a glass conference table, Lowe the director pops underneath for a nifty “last breath” shot. In wearing so many hats at once, it’s amazing how shockingly clever a film Lowe is able to string up from all aspects. Her killing-in-the-name of thriller stands as one of the glowing examples of a generic genre benefiting from an albeit unhinged female perspective – righteous retribution stemming from fears of motherhood. Prevenge is a breathtaking, savage debut from Alice Lowe, one that boasts horrific moral deprivation and a sense of humor drenched in maternal madness. Lowe’s character uses trauma and verbal hallucinations (possibly?) to rationalize her mass-murder spree, arguing with her baby bump every step of the way. Sure, there might be questions of how the prego assassin can get away with slaughtering so many people (who most likely don’t deserve it), but Lowe’s tortured world builds an atmosphere that never requires questioning. This is a pulpy, progressive take on a typically male-dominated genre, running off the psychotic fumes of vicious single-mother dramatics. Sympathy, fear, admiration, doubt – those are just a handful of the emotions Lowe so emphatically conveys on-screen, and they explosively combine for the film’s final, absolutely perfect closing frame. Welcome to the directorial fold, Ms. Lowe. I cannot WAIT to see what dark, f*$ked up fairytale you cook up next.